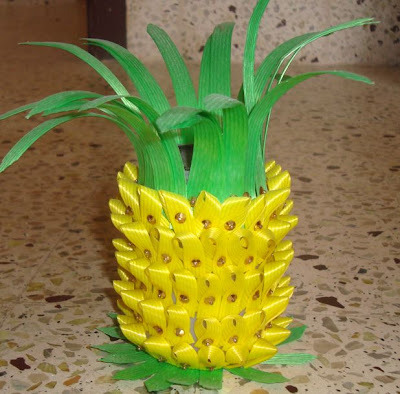 6 Response to "Hobby Ideas : Crafts - Pineapple"
Pineapple looks so cool. We used to do this on a parachute oil bottle when we were kids. You are very creative and luved all your creations:).Thank you for stopping by. wow this looks so cool!!! pineapple looks really cute. Nice idea.. You seem to be really creative. Keep it going. Thanx for visiting my blog and for the lovely comments..u r very talented,me too lov pencil drawings,thats a cute pineapple..
You have a fabulous blog going here. Thanks for dropping by on Food-n-More. Do you have any ideas for Diwali lanterns that can be made by kinder garten kids?